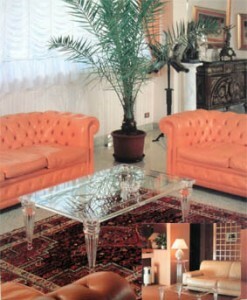 ﻿ Furnishings and interior design in plexiglas Poliedrica s.r.l. 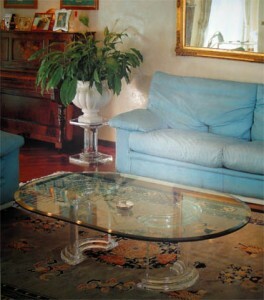 The artistic ability of our artisans led us to have a great possibility of lines and shapes sometimes recalling classical forms and some other time being extremely new, eccentric and innovative: dining tables, coffee tables, chairs, consoles, columns, lamps, showcases, and general furnishings… everything realised in the best quality plexiglas (lucite cast acrylic – pmma), produced in Italy according to the quality standard of MADE IN ITALY. Beside our line production, we also realise customize works based on the customers’ ideas or designs. Several times we showed our production in the most important design and furnishings fairs of Italy, like the Salone Internazionale del Mobile ( I Saloni ) in Milan, the fair of Verona, and abroad, the fairs of Koln, Frankfurt, as well as ‘Index’ in Dubai. 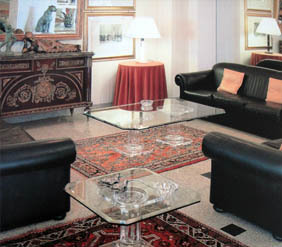 the catalogues of our production are present in many of the most famous designers and architects studios.